A new notification flashes on your phone's screen and when you check, you find that someone just started to follow you on Instagram. You get delighted, don't you? Now how about getting a similar notification from Instagram when someone unfollows you? Sadly we don't get any. Instagram doesn't inform a user when someone unfollows him, nor does it tell who unfollowed. And so the user is often left scratching his head, wondering who the unfollower was. Of course, following or unfollowing someone is a personal choice and we can't force someone to follow us or not to unfollow us. But let's be honest, no one likes to see his number of followers diminishing, isn't it? (c) Or was it because of some back-end issue in Instagram or due to some bug in there? In that case too, you might see a decreased followers count for a short period of time. But the figure gets corrected as soon as the bug gets rectified. However if none of the above cases hold true, then it must be (what I call) the "self-seeking instagrammers" who unfollowed you. Their motive nearly always is centred solely around growing their own followers count. Such instagrammers will first start following you in the hope that you will follow them back. And when you do that, they will unfollow you, just like that. If you don't follow them back, they will, in any case, unfollow you. Candidly speaking, I keep away from such self-seeking instagrammers who wouldn't be following me because they genuinely liked something in my photos or posts, rather it was just to obtain a follow back from me! For them, I am just a number to be added to their followers count. Once they have me in their followers list, they would invariably unfollow me. So how to track these unfollowers? 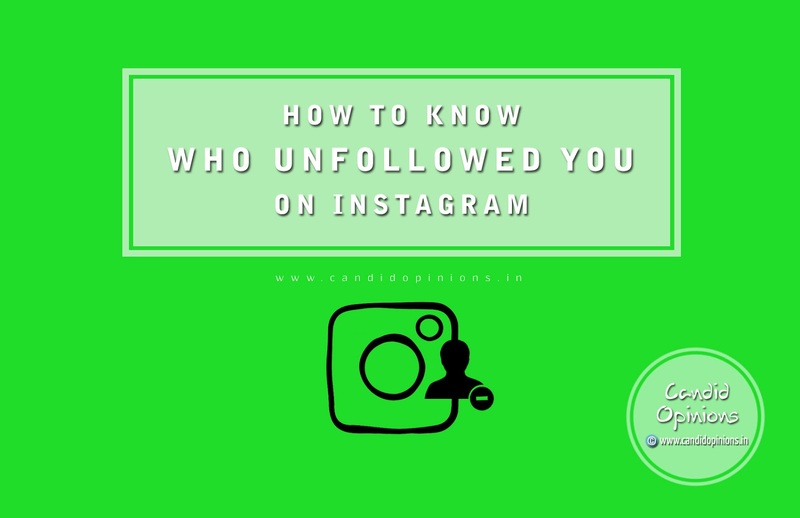 One way of doing that is by minutely checking on Instagram itself, whether we feature in the 'Following' list of each of the instagrammers whom we follow, but this method of manually identifying the unfollowers is quite cumbersome, more so if we have a lot of followers. On the other hand, there are quite a few third-party apps that can identify our unfollowers on Instagram. However, with so many hackers on the prowl with their fake apps, you need to be extra careful while choosing these third-party apps. Or else you might even end up losing access to your Instagram account altogether! FollowMeter is a very handy utility tool for managing one's Instagram account. With this app, a user can not only identify who followed or unfollowed him on Instagram, for free but can also discover his ghost followers and secret admirers. That apart, the app also provides the user various insights about his Instagram account - like which post was liked the most by his followers or who were his top fans (most likes by which follower) or who were the top commenters on his posts and so on (however, one needs to make in-app purchase paying a small fee for these extra features). Similarly there is also a 'Discover' section where a user, by paying a small fee, can add his account to get featured on the FollowMeter app and gain new followers. 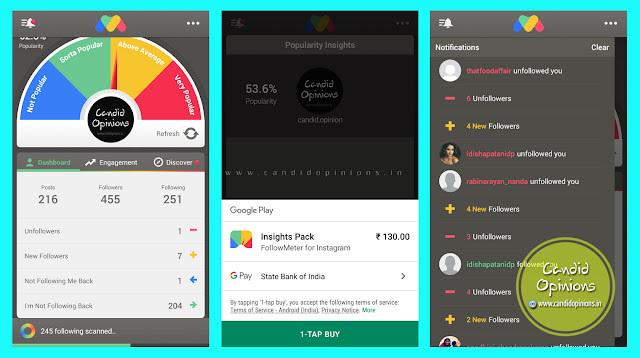 Once you connect your Instagram account with this app, it will at once analyse your account and will show you a popularity meter (telling you how popular you are depending on which of the four divisions the meter scale ends up - 'Not Popular', 'Sorta Popular', 'Above Average' or 'Very Popular' ). Besides that, on the 'Dashboard' you will find 'Unfollowers' (who unfollowed you recently), 'New Followers', 'Not Following Me Back' (who don't follow you back) and 'I'm Not Following Back' (which of your followers you are not following back). Another helpful feature of FollowMeter is the 'Push Notifications' option. Upon tapping on the three dots seen on the top right corner, the user can get into the Settings page where he can to turn on the 'Unfollowers' notification option. If he chooses this option, he will be notified whenever someone unfollows him on Instagram. Isn't that useful? (d) it is very organised and clutter-less, even the free version is devoid of those irritating ads. It has been more than two years now that I have been using FollowMeter for one of my Instagram accounts and I can vouch for its reliability and safety. According to me, the second most handy app for identifying the unfollowers on Instagram is the 'Followers Assistant' app. With this app, you can easily find out who stopped following you (and with just a tap on 'STOP FOLLOW', you can then and there stop following him/her back). The dashboard of this app shows four sections: 'Who stopped follow' (unfollowers), 'Who doesn't follow' (who doesn't follow you back), 'Follow back' (who you are not following back) and 'White list'. This app is currently available only for Android devices. I have been using Followers Assistant for my food-related Instagram account since the last one year or so and I must say, I am very impressed. Although it's a freeware and doesn't provide that many insights to one's Instagram's account as others but still this app is certainly very efficient in detecting unfollowers on Instagram. Hey Amit, many many thanks, FollowMeter is indeed very useful to know who unfollowed me. Goodread, I will check this out. I have tried many apps before didn't find anything helpful for Insta. Yes, Payal, you may use any one of the above two apps, they both are equally good although FollowMeter has a few more features.